Ten free subscriptions on offer to celebrate! This month, firstwriter.com has launched a page on Google's new Google+ service – a social media service from the internet search giant which is intended to rival established services like facebook. When firstwriter.com launched onto facebook and twitter we announced facebook and twitter competitions, whereby users would be entered into a prize draw for free firstwriter.com vouchers worth $15 / £10 / €15 simply by liking / following firstwriter.com on one or both of the services. The launch onto Google+ will be no different, with vouchers on offer to TEN lucky users who add firstwriter.com to one of their circles on the new service. Vouchers can be used to create anything up to a quarterly subscription for free, or can be put towards the cost of taking out an annual or life subscription, granting immediate access to the details of thousands of markets to help you get published, including literary agencies, book publishers, writing contests, and magazine publishers.. The competition will run till March 1, 2012, at which point ten lucky winners will be selected from everyone with firstwriter.com's page in their circle at that time. If you're already following firstwriter.com on facebook or twitter you can still get another chance to win by joining us on Google+. The facebook and twitter competitions don't close till December 1, 2011, so you still have a chance to follow us on all three services for three chances to win! And even if you don't win any of the vouchers on offer, you'll still benefit from all the free information for writers you'll receive through these services, including opportunities for writers and articles from publications around the world. Eric Houghton recently secured a deal with a literary agency as a result of searching firstwriter.com's database of over 850 literary agents. We asked him about his writing, and how he found success. fw: Thanks for taking the time to talk to us, Eric, and congratulations on your deal. Tell us a little about your book. EH: My book, Boozehound! Breaking a 30-Year Obsession, is a memoir in two parts, really. It begins with my wild, final weekend of drink and drugs, when all the lies were discovered and I was forced to seek help. I end up at Carrier Clinic in New Jersey, and I am amazed to find myself alive upon waking up that first sober morning in April 2010. The rest of the book alternates between my drinking life and my seven-day stint at Carrier. fw: What made you decide to turn your experiences into a book? EH: While at Carrier, I could not believe all the things that were happening to me, and in quick succession. I had two amazing and wacky roommates, and there were plenty of other colourful characters there, as well. I began taking copious notes, and was able to see a "Cuckoos Nest" sort of slant right from the get-go. The ideas for a book were planted almost immediately. fw: How did you go about writing it? EH: At the end of the summer in 2010, when I was only a few months sober, I was going back to work, and I had to fill up my days in a positive way, lest I start returning to the old ways of waking up and setting off to the liquor store. I figured a couple hours of writing every morning would be an ideal way of getting the day off to a positive start. This proved to be the case – and more. The consistency of a daily writing regimen was the key to success for me in this venture – indeed with any big plan going on in my life. It took me six solid months, and the completed draft of 100,000 words was completed in that time. EH: I write a weekly summer column for a newspaper in my hometown of Long Beach Island, New Jersey. This is called Clammer's Diary, and is autobiographical, based on my days growing up at the Jersey Shore clamming and enjoying the wild summer life there. I also wrote another memoir, The Diets of Tom Patterson, unpublished, back in 2001.
fw: How important do you think having such a writing history is when trying to secure a literary agent? EH: Well that depends of course. I am published every week in the summer, but this is my first crack in the big-time. Certainly agents would want to work with someone who has had success in the past, I would think. Being unknown as I am, getting an agent or getting published must be one of the most difficult tasks imaginable. I can only say that I was persistent, even a bit pushy perhaps, but I saw in my agent a person who was helpful and forthright with me, even when she was rejecting me. I had some other leads and kept her in the loop, and she finally took pity on me, and gave me a second look. I will forever be grateful to her. fw: And how did you go about finding agents to approach? EH: I used firstwriter.com from the start, identifiying dozens of agents and publishers, honing my query and other supporting material and contacting the specific person or company with exactly what they wanted. fw: How did you submit your work? EH: Almost exclusively by email. I did call a few agents, and basically got cussed out, as this is considered a gross technical foul in the literary world. fw: Were there any particular features of firstwriter.com that helped you find success? EH: The daily new contacts sent via email were extremely helpful, as were the reviews of each agency and publisher. It made the process of contacting with the correct materials quite simple. fw: Did you do research on what form your submission should take? EH: Yes, I read a few books and they were helpful in fine-tuning my query and synopsis, etc. Again, I sent out ONLY what the agents or publishers wanted. One thing was made clear to me: don't send manuscripts or anything that they don't ask for, lest they all end up in the circular file (which 95% of do anyway!). fw: How long did it take you to secure your agent? EH: It took me six months to write Boozehound! and seven to secure an agent. I contacted well over 100. Hopefully, together we can go ahead with a strong platform and find a publisher willing to take a risk on an unknown drunk from Jersey. fw: I guess you must have received a lot of rejections. EH: I got nothing but rejections and worse. By worse I mean I was totally ignored by the majority of agents and publishers. Of the approximately 150 agents and publishers I contacted, only about 50 bothered even to reply, and most were canned, auto-responses. I took it all in stride, cursed and wallowed around in a morass of self-pity. But, I didn't drink over it, and kept plugging away. And yes, they were courteous and polite WHEN they responded. It's amazing, but I actually started looking forward to being rejected. Strange, huh? fw: What do you think was the reason you succeeded in securing this agent? Why are you a good match? EH: I was persistent, as I said, and she saw something, I guess, that perhaps gave her the impression that this thing actually could be published. It is all new, so this match question cannot be answered yet. fw: How have things changed, now that you have an agent? EH: It feels great, like this little dream of mine can actually come to pass. I'm sure it's no different from any writer when they secure an agent. It validates what we've been working towards, and quite possibly could mean we are on our way. But, I know there is plenty of work ahead, and that's just fine with me. fw: What advice would you give to other writers? EH: Keep trying, keep looking and writing and sending exactly what they ask for. Don't give up, and don't call the agents, for God's sake. EH: Like I said, this is all new. I just sent my signed contract in yesterday, so I am just buckling up for the long ride. I hope to eventually write about my first year in sobriety. Should be a decent sequel: Son of Boozehound! Whattya tink? fw: Thanks for taking the time to talk to us, Eric, and best of luck with your book! To search firstwriter.com's database of over 850 literary agents click here. Following Two Ravens Press' recent initiative to refocus its list on "eco-literature" and writing that challenges and unpicks the status quo (see www.tworavenspress.com), and the announcement of their new magazine, EarthLines, (see http://earthlinesmagazine.wordpress.com) they have announced that, in November 2012, they will publish a volume of collected eco-poetry that addresses the complex relationship between people and the natural world. As the world faces the possibility of climate change we are frequently called to alter our behaviour and lifestyles, to revisit our relationship with the environment and, somehow, to "reconnect with nature". But what does reconnection mean, and, more importantly, what does it imply? And does literature, and specifically poetry, have any role to play in that reconnection? Is it "the song of the earth" as has been claimed? Can a poem help bridge the growing dissociation that pervades the relationships between contemporary humans and the natural world? Is poetry in itself a form of environmental action, or can it inspire action? In November 2012 Two Ravens Press will publish a volume of new poetry that addresses these questions. With an introduction by Dr David Borthwick (University of Glasgow) which questions the moods of estrangement, guilt and elegy which one finds in recent poetic responses to nature, the anthology will be the focus for a new wave of poetry that seeks to directly respond to the world in which we find ourselves, and that dramatises a growing hunger for a meaningful connection with the earth. If you would like to submit your work to the eco-poetry anthology, please email up to three poems that clearly fit the brief above to editors Sharon Blackie and David Knowles at info@tworavenspress.com. Microsoft Word format only. Submissions by email only. The deadline for submissions is March 31, 2012. All contributors to the anthology will receive a free copy of the published book. Royalties of 8% RRP will be offered on sales of the book but the publishers propose to donate those royalties on behalf of all contributors to the John Muir Trust, the UK's leading wild land conservation charity. Do you have a passion for writing and a desire to see your work inside your favourite magazine, but you have no idea how to get it there? Award-winning journalist and author, Diana Cambridge has written a step-by-step guide to help the aspiring writer finally fulfil their dreams of becoming an established writer, due to be released January 2012. Many of us have a dream job we would like or something that we have a real passion for, but are often put off chasing those dreams because of lack of confidence. “Lack of confidence – not lack of talent – often sabotages beginner writers.” says Diana Cambridge. If you truly believe you have the talent for writing, but you lack the confidence to take it further, because you have no idea where to start, then Diana’s new in depth, step-by-step guide can help you on your journey. Writing for Magazines – the Essential Guide is broken down into sections, which not only make it easy to follow, but allow you to take in the information at your own pace. Diana Cambridge has been the editor of eight magazines that vary in subjects so she knows how write for magazines and help you get there. 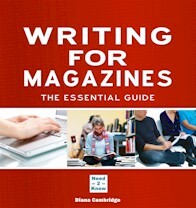 Published by Need2Know, Writing for Magazines – the Essential Guide will be available to order from the Need2Know website www.need2knowbooks.co.uk, by calling +44 (0) 1733 898103, or emailing need2knowoffice@gmail.com. The book will also be available from January 2012 in all good book shops. Writing for Magazines – the Essential Guide will be available in large print format and as an eBook from the Need2Know website. A new online publishing company is looking for authors of novels and short stories. Ever had an idea for a comedy sketch? Circalit is back once again helping talented comedy writers get their sketches produced and distributed. This time Circalit has teamed up with award-winning filmmaker, Jason Wingard, whose most recent short, “Ben and Jackie” has been short-listed for the Virgin Media Shorts 2011 and the Reed.co.uk Short Film competition. The competition is part of Circalit’s Get your Film Made series. The winning script will be directed by Jason, who has worked alongside fantastic comedians such as Johnny Vegas, and companies such as Channel K, MTV and 2-Entertain. Participants are actively encouraged to collaborate with one another to produce the best, most groin-tearingly funny piece of comedy they can. The deadline is Thursday December 16, and submissions are being read as soon as they’re submitted – so the sooner you enter the better! For more details, check out: http://www.circalit.com/projects/competitions/jason. Win £150 and see your story published on the Oxford Editors website and as an e-book. Oxford Editors believe in the short story and have seen the market for these grow over the last few years, so they have decided to launch their first Short Story Competition this year. You can write on any subject as long as it is an original piece of work that has not been previously published, and is no longer than 4,000 words. The winner will have their story published on our website and also published on Amazon as an e-book. They may also publish the runners-up on their website. The prize is open to new and previously published writers, and you can enter as many times as you like. There will be a fee of £3 for each entry to cover printing, copying and postage to judges. send a photo of yourself and a brief biography via email. Win £100 and a 50 per cent discount on the assessment fee for your completed book. Sometimes that first chapter is the hardest step to take, so in order to encourage you to get started Oxford Editors are also running their First Chapter Prize. Just give them the first chapter of your book for the chance to win the cash and get a substantial discount on their manuscript assessment service. You can write on any subject as long as it is an original piece of work that has not been previously published, and is no longer than 7,000 words. This prize is also open to new and previously published writers, and you can enter as many times as you like. There will be a fee of £3 for each entry to cover printing, copying and postage to judges. photo of yourself and a brief biography via email. Bradt Travel Guides together with The Telegraph Adventure Travel Show will host two new travel writing seminars on Saturday January 28 and Sunday January 29. During the seminars, leading industry experts will offer an introduction to the key areas of travel writing. Newspapers, magazines, online, books - what writing would best suit you? Improve your writing - how to approach and shape a piece of writing to ensure it is as powerful as it can be. How to turn your travel experiences into articles. Learn how to find your way in the marketplace. What editors want and how to pitch them. Online publishing - writing for the web. So if you want to get the low-down from some of the best people in the business, come and join us! We will update a full schedule of events shortly and we anticipate the places to fill quickly, so make sure you book your place early to avoid disappointment.